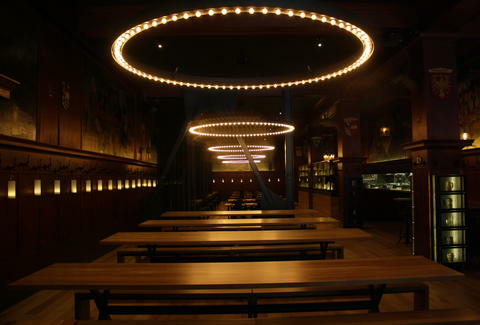 With apologies to Suppenküche (fine, and Schmidt's and Leopold's, too), there's a new best German beer hall in town, and it's in the place you'd least expect one: Financial District relic Schroeder's, which has been holy-crap-wow-this-is-incredible resurrected by the pair behind Press Club. 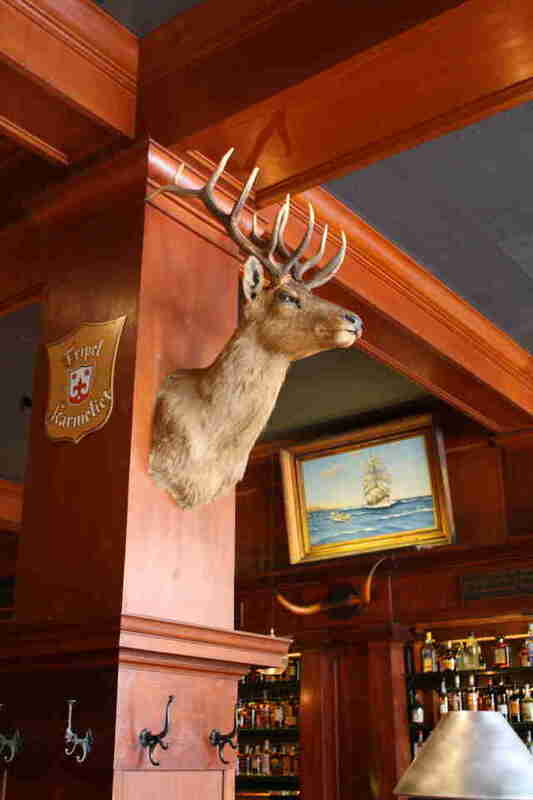 The new Schroeder's keeps all the good stuff about the old (the beer boots, the old murals, this awesome deer head, ... the other beer boots), replaces all of the bad (the linoleum floors, the crap everywhere, the old ladies in dirndls, and oh God, the food), and leaves the FiDi with a super pub with a drop-down projector screen for the World Cup, rentable stein lockers (wut), and food from an Incanto alum with parents from Deutschland. The sign? It's the same! 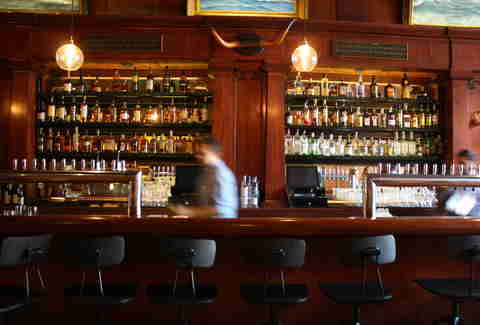 And the bar? It's the same, too! Well, kinda the same: their 22-draft beer program is being managed by one of three master beer cicerones in the world (dude has brewed at Social Kitchen & Brewery, ThirstyBear, and Gordon Biersch). 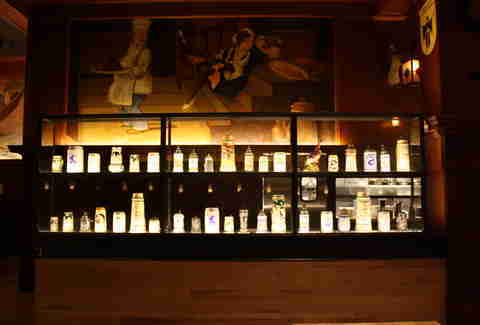 Plus, there's now a Rye alum handling cocktail-making duties. Actually yeah, not really the same. 17 of the beers are Czech, Austrian, or German -- plenty of which you've probably never had or heard of (paging Ritterguts Gose), while the final five slots're saved for German-leaning local crafts like Magnolia's Kalifornia Kolsch. 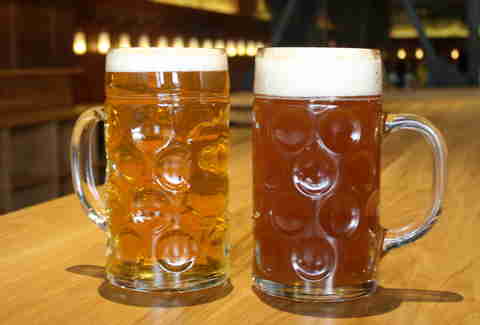 You can get them in pints (yaaaaaawn), steins (yawn? ), or massive boots (hiccup!). 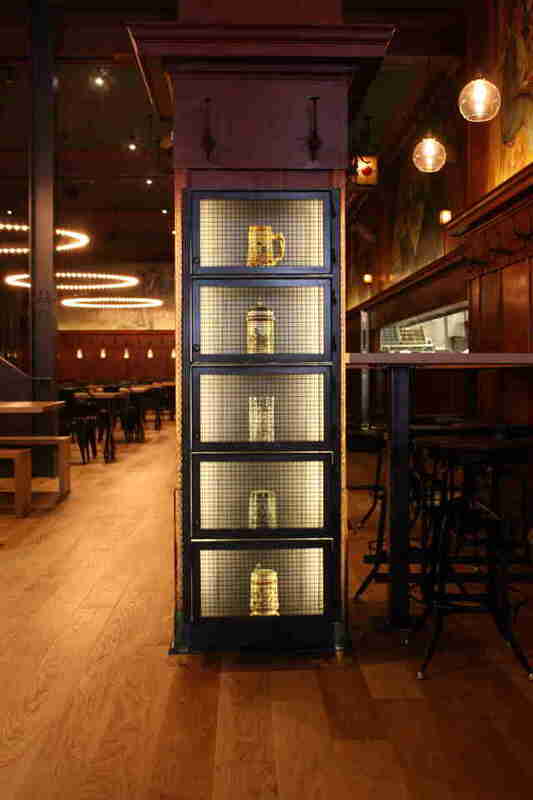 ... these rentable stein lockers (seeeeee! ), where they'll house your personal-liter-of-beer-holding glass, provided you 1) pay a flat fee, and 2) spend at least $50 every month on food/beer/probably just beer. 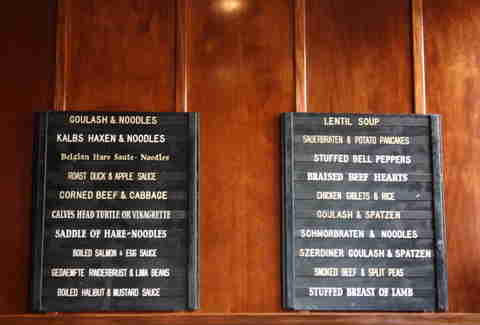 These are the old menu boards from Schroeder's, which're there as sort of a nostalgic hat tip and NOT a list of the actual menu items (sorry, Kalbshaxen fans). The actual menu does California-takes on German food, but in the best way possible. 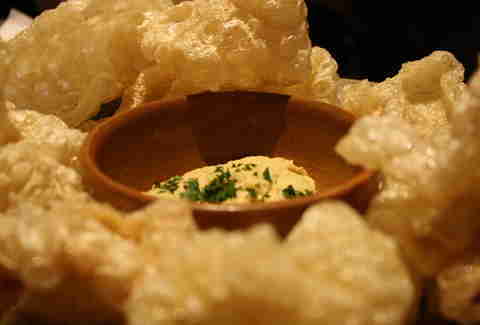 They keep most of the German mains (brats, schnitzel) very authentically German, but California-up the sides, like these pork cracklins or a seminal spaetzle appetizer that adds corn, tomato, ricotta, and onion blossoms. 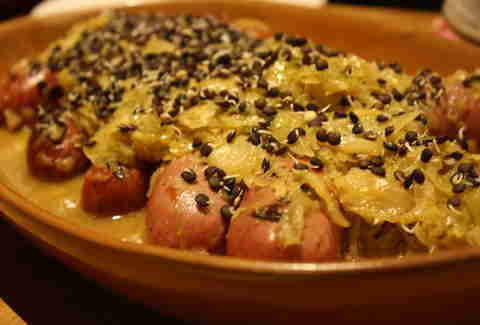 Did we mention they'll do family-style plates of sausage? 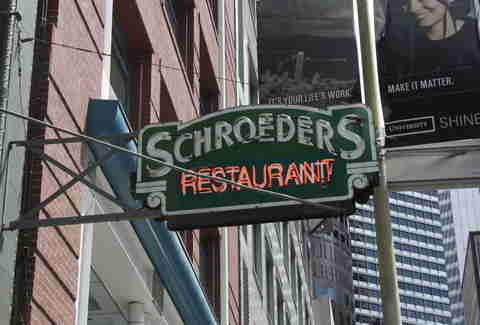 'Cause they'll do family-style plates of sausage. Grant Marek is a Senior Editor at Thrillist and wants a stein locker more than anything he has ever wanted in the entire world. Go in on one with him on Twitter @grant_marek.